USB HIGH-SPEED CHARGING SURGE PROTECTOR : Max USB output per port of our USB power strip surge protector is up to 2.1A(Total USB output is 2.4A) that can gives your USB devices a fast speed charge! 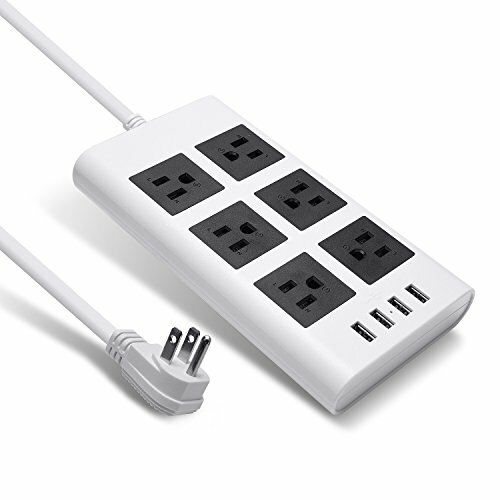 RIGHT ANGLE PLUG: The right angle design(flat plug) of this electric surge protector power strip helps you plug in the socket easily in tight spaces or behide the furnitures and the 9.5ft long cord is very convenient for you to use. Please pay attention to the orientation of the plug and the sockets before your purchase. Make sure they fit your devices. NO BLOCKING: There are enough spaces between two outlets, more advantageous than traditional power strips. It is good for travel to another countries with small size: 8.0"x4.2"x1.1"(Voltage:125V-250V. Max wattage is up to 1875W if under 125V; up to 3000W if under250V.). NO SAFETY HAZARD AT ALL: FCC & RoHS Certificates. Multiple protections! This electric usb power strip has lightning protection, surge protection, overload protection, and fireproof function(V0:Very high level). It will automatically cut power to protect connected devices when voltage surge or over-current is detected. And no naked flame even if it is burned. Please be assured to use our USB surge protector power strip with usb.